Wildfire Invisible Clear Color Polyurthane Top Coats are clear under ordinary light, but reveal their color under black light. They are the "secret weapons" for creating invisible black light artwork. Use as a top layer and the clear coat will allow the underlying layer to be visible in ordinary light. But under black light, the top coat reveals its color. These unique paints can be applied to just about any surface as long it's properly cleaned and primed. However, due to their higher sensitivity to sunlight these paints are recomended for indoor use only. 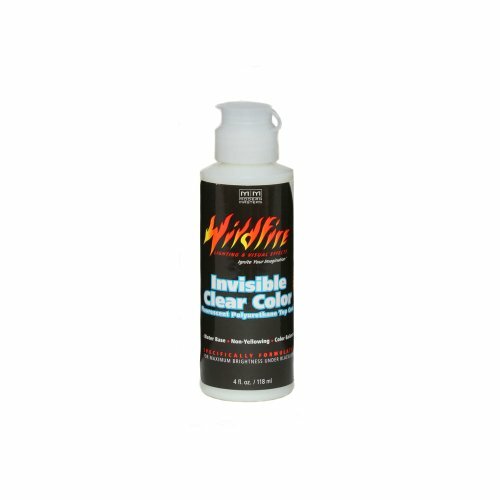 Wildfire Invisible Clear Polyurethane Top Coats are super-saturated with UV sensitive pigments, making them the brightest black light paints available. This is why HOLLYWOOD scenic professionals choose Wildfire paint for creating spectacular UV effects. All Wildfire Paints are water-based and completely non-toxic. If you have any questions about this product by Wildfire, contact us by completing and submitting the form below. If you are looking for a specif part number, please include it with your message.